↑ Buchta, Wilfried. "Taking Stock of a Quarter Century of the Islamic Republic of Iran" (PDF). Harvard Law School. Harvard Law School. สืบค้นเมื่อ 2 November 2015. ↑ "Battle Between Persians and Russians". State Hermitage Museum. สืบค้นเมื่อ 2009-09-19. ↑ "ศาสนากับการเมืองในอิหร่าน". เสรีภาพ ณ ชะเยือง. สืบค้นเมื่อ 2010-10-25. ↑ "تعداد جمعیت و خانوار به تفکیک تقسیمات کشوری براساس سرشماری عمومی نفوس و مسکن سال ۱۳۹۵". Statistical Center of Iran. ↑ Kim Murphy – Los Angeles Times (2007-01-07). "U.S. targets Iran's vulnerable oil". Heraldextra.com. สืบค้นเมื่อ 2011-06-18. ↑ "Iran" (PDF). สืบค้นเมื่อ 2011-06-18. ↑ "No Operation". Presstv.com. สืบค้นเมื่อ 2011-09-14. ↑ "Iranian nuclear power station 'begins generating electricity'". Reuters. The Guardian. 4 September 2011. สืบค้นเมื่อ 4 September 2011. ↑ "Encyclopaedia Iranica. R. N. Frye. Peoples of Iran". Iranicaonline.org. สืบค้นเมื่อ 2011-09-14. ↑ 24.0 24.1 24.2 CIA World Factbook. "Iran". สืบค้นเมื่อ 2008-03-04. ↑ 25.0 25.1 Library of Congress, Library of Congress – Federal Research Division. "Ethnic Groups and Languages of Iran" (PDF). สืบค้นเมื่อ 2009-12-02. ↑ Walter Ralston Martin, Ravi K. Zacharias, The Kingdom of the Cults (2003), p.421; Excerpt: Ninety-five percent of Iran's Muslims are Shi'ites. ↑ Bhabani Sen Gupta, The Persian Gulf and South Asia:: prospects and problems of inter-regional cooperation. p.158; Excerpt: Shias constitute seventy-five percent of the population of the Gulf. Of this, ninety-five percent of Iranians and sixty of Iraqis are Shias. ↑ Daily report, Issues 64–73‎ -'United States. Foreign Broadcast Information Service- Page 50, Excerpt: Ninety -five percent of Iranians are Shiite Moslems. ↑ International Federation for Human Rights (2003-08-01). "Discrimination against religious minorities in Iran" (PDF). fdih.org. p. 6. สืบค้นเมื่อ 2009-01-17. ↑ International Federation for Human Rights (2003-08-01). "Discrimination against religious minorities in Iran" (PDF). fdih.org. สืบค้นเมื่อ 2007-03-19. ↑ "Sassanids in Africa". Transoxiana.com.ar. สืบค้นเมื่อ 2011-06-18. ↑ "Iransaga: The art of Sassanids". Artarena.force9.co.uk. สืบค้นเมื่อ 2011-06-18. 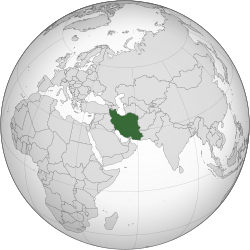 ↑ "Iran – A country study". Parstimes.com. สืบค้นเมื่อ 2011-06-18. ↑ "History of Islamic Science 5". Levity.com. สืบค้นเมื่อ 2011-06-18. ↑ 37.0 37.1 Afary, Janet (2006). "Iran". Encyclopedia Britannica Online. สืบค้นเมื่อ 2007-10-29. ↑ Erik Nakjavani (December 15, 2008). "QAMAR-AL-MOLUK VAZIRI". Encyclopaedia Iranica. ↑ "The Zarathushtrian Assembly". Zoroastrian.org. สืบค้นเมื่อ 2011-06-18. ↑ "Leaders of regional countries to mark Nowruz". PressTV. สืบค้นเมื่อ 2011-06-18. ↑ "General Assembly Fifty-fifth session 94th plenary meeting Friday, 9 March 2001, 10 a.m. New York" (PDF). United Nations General Assembly. 9 March 2001. สืบค้นเมื่อ 2010-04-06. ↑ "U.S. mulls Persian New Year outreach". Washington Times. 2010-03-19. สืบค้นเมื่อ 2010-04-06. Iran. Weekly program that explores Iran's past, present and future with exclusive reports. หน้านี้แก้ไขล่าสุดเมื่อวันที่ 9 มีนาคม 2562 เวลา 02:50 น.